Have you been told that you need dentures? Or, do you have dentures that simply don’t fit right or feel good? If so, implant retained dentures are comfortable, stable, and more practical than traditional dentures. Enjoy Your Food and Talk Easier! The unique design of implant dentures makes them smaller and less invasive than large denture prosthesis. A traditional denture uses a large acrylic shelf that covers the roof of your mouth as well as wraps itself over the ridge of your jaw, so that even the gum tissue is recreated in appearance. This makes it impossible for some people to taste and enjoy their food, and also makes speech more difficult. An implant denture is “U” or horseshoe shaped to follow the ridge of your jaw. The entire appliance is slim in design, and is permanently attached to 4 supporting implant roots. 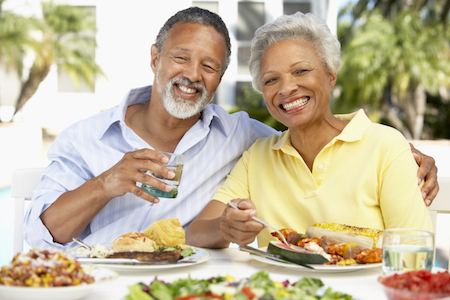 When you wear an All on 4 Implant Denture, the roof of your mouth is free to enjoy food, and you have an easier time talking. All on 4 Implant Dentures are permanently anchored into place, keeping them stable all day long. If you’ve previously been told that you don’t have enough bone to stabilize an implant, then bone grafts can be added to give you the support that you need. Your oral tissues are delicate and need oxygen. By freeing up the roof of your mouth, you can prevent common infections like yeast or thrush. Implant dentures also help you avoid sore spots due to ill-fitting appliances that place stress on or rub the roof of your mouth. Because our dentures are mounted on implants, they fit correctly from day one.